The Gospel Invitation | Theopolis Institute | Bible. Liturgy. Culture. Is there a Gospel invitation? To many evangelical Christians, the answer to that question is an unqualified “yes.” Some calvinists, reacting against the misleading character of the “altar call,” seem less interested in inviting men to anything than they are in sending men away to think about the message they have heard. The answer to this conflict is to understand that the Gospel invitation is an invitation to come into Jesus’ house and have supper with Him. The psychological instinct in the “altar call” is correct: Men should do something and come somewhere in response to the call of the Gospel. Physical response, holistic response by the whole person, is the proper response to the Gospel. It is a perversion to hide the Lord’s Supper from view and to ask men to make some hidden, inward motion of the “soul” in coming to Christ. The Biblical gospel addresses the whole man, and the whole person is expected to respond. To come into Jesus’ house to eat His Supper, a person has to cross the threshold of the house. That threshold crossing is the sacrament of Baptism. We do not invite men to be baptized; we invite them to come in and eat, but they must cross the threshold and be baptized before they can sit down. In the parable of the wedding supper (Matt. 22:1-13), one man shows up without the proper garment. Obviously, he did not come in through the door, or he would have been washed and given one (cf. also John 10:1-9). It is interesting to note how the Greek philosophical influence has gutted Scripture of its clear meaning for so much of Christendom. In Revelation 3:20, for example, Christ asks to be admitted to the church so that He can participate in His own Supper! This, however, is instinctively read by the modern mind as “asking Jesus into your heart,” which the passage really has next to nothing to do with. Revelation 3:20 is speaking of the covenant meal. Similarly, the parable of the wedding feast (Matt. 22:1-13) and the entire discussion of the Gospel in Luke 14:1-24, as well as such passages as Isaiah 55, are read as if only some inward “spiritual” matter were under consideration. Not at all. The invitation is to a real meal, one at which Christ is present as Host. Real food, physical food, is to be eaten. From the Garden of Eden to the Tree of Life in the book of Revelation, shared food is a sign of the covenant between God and His people. The Scriptures have so much to salon this that one scarcely knows where to begin. Melchizedek shared bread and wine with Abram (Gen. 14:18). God shared a meal with Abraham (Gen. 18). When Jacob and Laban made their covenant, they shared a meal (Gen. 31:44-46). The Passover meal was the sign of God’s covenant to Israel in Egypt, and down through the ages thereafter. At Sinai, when God established the covenant with Israel, Moses and the elders ate with God (Ex. 24). At the Feast of Tabernacles, the people were to eat in the presence of God and rejoice (Deut. 14:22-27). In the wilderness, the people ate manna and drank water from the rock, both of which were sacraments of Christ (John 6; 1 Cor. 10:1-5). The milk and honey in the land (house) of promise were tokens of God’s presence and blessing. And we can go on and on, not to speak of the other feasts in Israel, and the Peace Sacrifice that the family shared with the priest and with the Lord. Are these all “spiritual” meals? Away with such internalized Greek nonsense! Of course what matters most is the presence of Christ, and fellowship with Him, but He has ordained that fellowship to take place at a meal. He invites us over for supper every week, and we decide to eat with Him four times a year. Do you think He might possibly be offended? He invites His enemies, in the Gospel, to join Him for dinner, but we encourage men to contemplate an absent Christ in their souls. Is our evangelistic display askew? The Lord’s Supper is not some mystery kept hidden from the view of the world. Nor is it some mystical rite to be kept “special” by infrequent observance. It is as simple as dinner with Jesus, and more profound than any theologian can ever fully understand. 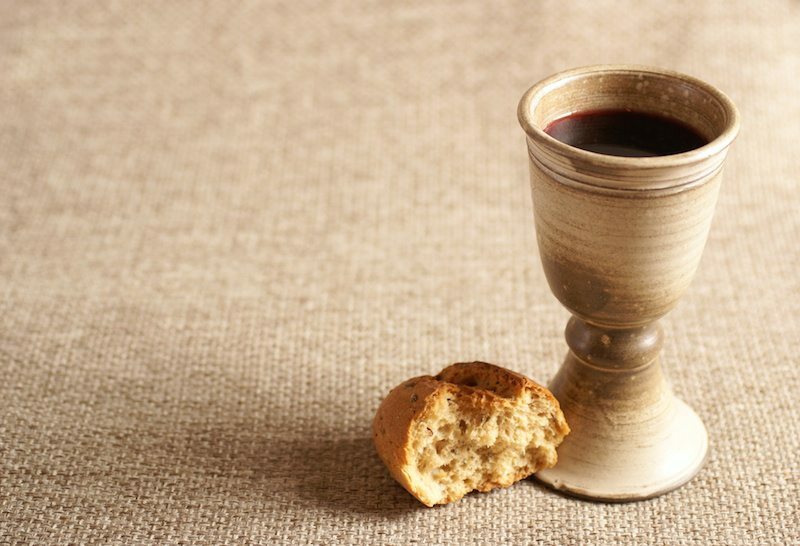 The Lord’s Supper does not have an exclusively backward orientation. It is a Medieval perversion to focus only on the death of Christ in the Lord’s Supper. The emphasis in Scripture is equally on the active presence of Christ at His Supper, and on the Supper’s prophecy that He will return. Holy Communion is not a morbid event, but a feast. Let the churches celebrate it as a feast, before the eyes of the world, so that the unconverted will realize the full extent of what they are being invited to partake of.